4th Street Studio Art show and Sale! 4th Street Studio is having another 'Under $100 Art Sale'! 10% of all sales goes to the Food pantry next door to the gallery. I will have several painting in the show too! What a great time to find unique Mothers Day gifts! 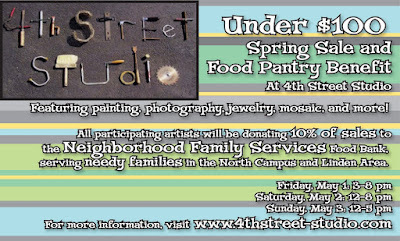 !May 2nd thru 4th, 2009 Please see the attached flyer for Times and location.